Looking for a way to make the most important day of your life unique and special? Trying to make everything look and feel perfect on your wedding day but you don't have the time or energy or don't know how to make it happen? Have you ever dreamed of having a wedding completely different from everyone else's? You have come to just the right place. Helle Travel Agency will plan and organize your wedding in Croatia suited especially to your needs and preferences, arrange every single detail from the wedding gown, venue, cake, dress code of the guests to ideal honeymoon destinations so you can simply relax and enjoy the process. Your imagination and our team of professionals is bound to create an original and unforgettable setting and make your fairytale wedding come to life. Irrespective of the time of the year, Croatia offers a multitude of magical locations that can be an ideal setting for a unique wedding experience. If you have always dreamed of a summer wedding, what could be more romantic than having a wedding on one of the enchanting Mediterranean islands? Just imagine yourself on a beautiful island of Vis on the Adriatic Coast, one of the most romantic honeymoon destinations. The intimate atmosphere of a secluded Stiniva beach, anticipation reflected by the dim glow of dozens of candle lights floating on the sea surface, extravagant scent of romantic gardenias and rosemary decorating the enclosing walls. The bride and the groom make a dramatic entrance on a vintage little boat decorated with gardenias and intertwined with old sea nets while the guests are seated on beautifully arranged benches across from them. The bride's loveliness is accentuated by the vintage dress whereas the groom is dressed in the traditional suit to match his gorgeous soul mate. They hold each other's hands while they solemnly say their vows to each other under the sky roof accompanied by the background sound of the sweetest melodies of Croatian a capella singing (“klapa“ music) … All this and more can be easily arranged for you should you require so. Whether you want a theme wedding aboard a luxurious yacht, in a light house, one of the most exotic gardens in Dalmatia or even in an exclusive villa in Croatia, we can make it all happen. As a special part of our offer we would like to point out weddings on hundred-year-old sailing boats that are part of a mesmerizing traditional setting. Renting a private boat will allow you to enjoy your wedding in privacy while cruising along the beautiful Adriatic Coast or simply admiring the view of some of the most capturing towns in Croatia such as Split, Omis and many more. We would also like to point out Hvar as a particularly enthralling island for your ideal wedding day and honeymoon. Its ancient fortress Fortica will provide a powerful combination of a rich historical background and romantic view of the city of Hvar and Pakleni islands. In case you are not sure where to spend your wedding day, we will gladly assist you with many more useful suggestions. 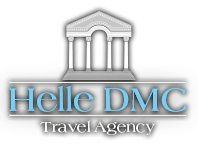 Helle Travel team realizes just how important it is to decide on the appropriate wedding style or a theme which is why we are here to help you organize every aspect of your wedding and lead you every step of the way. Whether you would prefer a vintage, rustic, seaside wedding or even one based on a particular color such as pink or yellow, we make all the necessary arrangements and select the wedding details with utmost care and dedication in order to make it unique and original. Always keeping in mind your personal preferences, we choose and select the decorations, venue, tableware, confetti, means of transportation and everything else so that they match a specific theme you opt for. We are sure that Croatia will provide you with plenty of inspirational motifs for your wedding so that you, your closest friends and family will feel like being a part of something truly authentic and outstanding on your special day. In case you cannot decide for just one wedding style or a theme, we can provide you with some of our own ideas and recommend you which themes would be particularly romantic in which setting. For example, why not take advantage of Dalmatia's stunning scenery and unspoiled nature and opt for a lovely vineyard wedding? The town of Split alone offers several magnificent and exclusive locations suitable for a Renaissance or Romanesque theme wedding, romantic whimsical wedding or vintage wedding in which you can make use of traditional Croatian customs and let your wedding be inspired by lush historical background. Regardless of the theme or style you decide on, Helle Travel team is dedicated to making your fantasies come true by finding the most romantic and breathtaking wedding venues in Dalmatia and by making sure every single aspect of your wedding day is arranged in a way that these impeccable moments match your vision and linger with you for the rest of your life.